Princess Pema Sal (Tib. ལྷ་ལྕམ་པདྨ་གསལ་, Wyl. lha lcam pad+ma gsal) (eighth century) was King Trisong Detsen and Queen Droza Changchub's daughter. After she died at the age of eight, from a reaction to a bee sting, Padmasambhava drew a red syllable NRI on her heart, summoned her consciousness, and restored her to life. There and then, he gave her the transmission of the Nyingtik teachings. She passed away soon after. 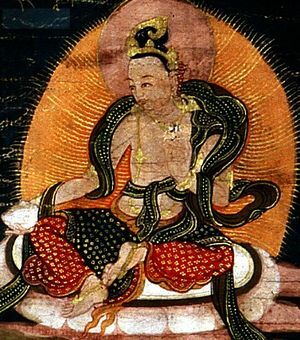 Yeshe Tsogyal concealed the teachings as terma, and centuries later, Pema Sel's incarnation, the master Pema Ledreltsal, revealed the Khandro Nyingtik cycle. His next rebirth was as the omniscient Longchen Rabjam. Dudjom Rinpoche, The Nyingma School of Tibetan Buddhism, trans. and ed. by Gyurme Dorje and Matthew Kapstein (Boston: Wisdom Publications, 1991), vol. 1, pages 554-555. Patrul Rinpoche, The Words of My Perfect Teacher (Boston: Shambhala, Revised edition, 1998), pages 196-197. This page was last edited on 4 May 2018, at 17:06.